Some hurricanes are of our own making. The breech in the soul of America began some 169 years before we became a nation in 1776. Hurricane Harvey was first then came Irma. The devastation in Texas and Florida is monumental and will take years to repair. Like Katrina and Andrew before them our nation will rise to rebuild lives and to repair the breeches. The generous and caring people of the United States will see to it. That’s our heritage. 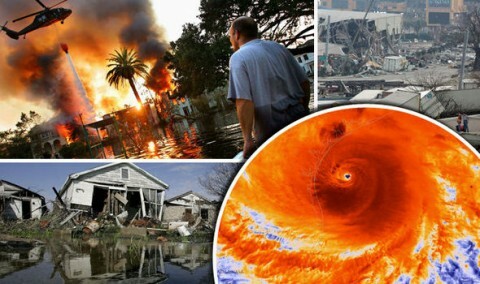 But sometimes the hurricanes and natural disasters we face are of our own making. Yet still the rebuilding is up to us. Such is the case with the unresolved issue of race in America. Such is the case with the aftermath of slavery. This breech in the soul of the nation began some 169 years before we became a nation in 1776. It continued until it became a chasm so large that over 700,000 lives were required to fill it in the nation’s most deadly war. That was the Civil War between the United States of America and the Confederate States of America (1861 to 1865). After 1865 it continued until 1965 when legal discrimination against the sons and daughters of former slaves officially ended. I say officially ended because the false thinking of White superiority and Black inferiority is the backwash of the hurricane of 258 years of slavery and 100 years of lynching, terrorism and "separate but equal" that still remains. But like the destruction of Harvey and Irma and Katrina and Andrew the job of rebuilding must be completed. It must be completed in our homes in our churches in our synagogues in our schools in our businesses and in our governments. It must be completed in our hearts and in our minds. And when the hard work of reconciliation is done we will be the better for it. It’s work that must be done. Just imagine that the devastated people and communities of New Orleans and surrounding states were left to themselves after Katrina. Just imagine that Texas and Florida are simply left alone after Harvey. Just imagine that the nation goes a step further to make it illegal to help them and then starts to fight against them. They would be like the communities of color all over the country that have been burdened by the nation’s failure to address its history of race and its devastating impact primarily on Black Americans on and White Americans as well. The hurricane force winds are one thing but the process of cleaning up the aftermath is where growth comes. We must make up our minds to do it. We must change the way we think. Slavery ended in 1865 but the false thinking that made it possible and that didn’t end when the war did must be abolished.